Raphael, the painter, not the Teenage Mutant Ninja Turtle, was both a master Renaissance painter and a master of our hearts. Raffaello Sanzio da Urbino, known purely as Raphael because last names are for nerds, was born on April 6, 1483 in Urbino, Italy, which, not to brag, was kind of a cultural center at the time. Raphael’s father was the court painter for the Duke of Urbino and taught him some basic painting skills and also taught him about the values of the Duke's court which were rational and humanistic, rather than religious or dogmatic. This wasn’t super helpful as a 10 year old, but came in handy later. Raphael’s mother died when he was 8 years old followed by his father when he was 11 years old. But little Raphie actually did fine as an orphan. He took over his father’s workshop and became such a talented painter that he got an apprenticeship with a painter by the name of Perugino. By the time Raphael was 17, he had earned the title of master. 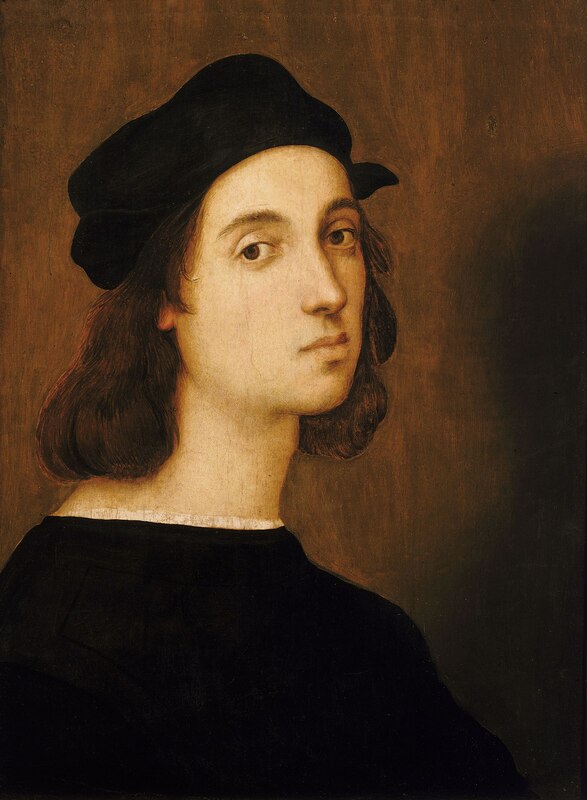 Full name was Raffaello Sanzio da Urbino, but like Madonna and Prince, everyone knows him as just "Raphael." His dad was court painter and poet to the Duke of Urbino (when you are a Duke in Italy in the 1490’s, you get a court painter – it’s an unwritten rule). Raphael painted the frescos on the walls and ceiling of the Pope’s private library at the same time that Michelangelo painted the Sistine chapel. Raphael had a buddy with a key and they secretly snuck into the Sistine chapel to check out Michelangelo’s progress. Michelangelo later accused Raphael of plagiarism and said "everything he knew about art he got from me." Dramaaa. Michelangelo hated Raphael and spread nasty rumors about him. The two were bitter rivals. No one of the old Italian masters has taken such a firm hold upon the popular imagination as Raphael. Other artists wax and wane in public favor as they are praised by one generation of critics or disparaged by the next; but Raphael's name continues to stand in public estimation as that of the favorite painter in Christendom. The passing centuries do not dim his fame, though he is subjected to severe criticism; and he continues, as he began, the first love of the people. The subjects of his pictures are nearly all of a cheerful nature. He exercised his skill for the most part on scenes which were agreeable to contemplate. Pain and ugliness were strangers to his art; he was preëminently the artist of joy. This is to be referred not only to his pleasure-loving nature, but to the great influence upon him of the rediscovery of Greek art in his day, an art which dealt distinctively with objects of delight. Moreover Raphael is compassionate towards mind as well as heart; he requires of us neither too strenuous feeling nor too much thinking. As his subjects do not overtax the sympathies with harrowing emotions, neither does his art overtax the understanding with complicated effects. His pictures are apparently so simple that they demand no great intellectual effort and no technical education to enjoy them. He does all the work for us, and his art is too perfect to astonish. It was not his way to show what difficult things he could do, but he made it appear that great art is the easiest thing in the world. This ease was, however, the result of a splendid mastery of his art. Thus he arranges the fifty-two figures in the School of Athens, or the three figures of the Madonna of the Chair, so simply and unobtrusively that we might imagine such feats were an every-day affair. Yet in both cases he solves most difficult problems of composition with a success scarcely paralleled in the history of art. Even the Master himself seldom achieved the same kind of success twice. His Parnassus lacks the variety of the School of Athens, though the single figures have a similar grace, and the Incendio del Borgo or Conflagration in the Borgo, with groups equal in beauty to any in the other two frescoes, has not the unity of either. Again, while the Parnassus and the Liberation of Peter show a masterly adaptation to extremely awkward spaces, the Transfiguration fails to solve a much easier problem of composition. Preferring by an instinct such as the Greek artist possessed, the statuesque effects of repose to the portrayal of action, Raphael showed himself capable of both. The Hellenic calm of Parnassus is not more impressive than the splendid charge of the avenging spirits upon Heliodorus; the visionary idealism of the angel-led Peter is matched by the vigorous realism of Peter called from his fishing to the apostleship; the brooding quiet of maternity expressed in the Madonna of the Chair has a perfect complement in the alert activity of the swiftly moving Sistine Madonna. Great as was Raphael's achievement in many directions, he is remembered above all else as a painter of Madonnas. Here was the subject best expressing the individuality of his genius. From the beginning to the end of his career the sweet mystery of motherhood never ceased to fascinate him. Again and again he sounded the depths of maternal experience, always making some new discovery. The Madonna of the Chair emphasizes most prominently, perhaps, the physical instincts of maternity. "She bends over the child," says Taine, "with the beautiful action of a wild animal." Like a mother creature instinctively protecting her young, she gathers him in her capacious embrace as if to shield him from some impending danger. The Sistine Madonna, on the other hand, is the most spiritual of Raphael's creations, the perfect embodiment of ideal womanhood. The mother's love is here transfigured by the spirit of sacrifice. Forgetful of self, and obedient to the heavenly summons, she bears her son forth to the service of humanity. Sister spirits of the Madonnas, and hardly second in delicate loveliness, are the virgin saints of Raphael; the Catherine, the Cecilia, the Magdalene, and the Barbara are abiding ideals in our dreams of fair women. The same sweetness of nature which prompted Raphael's fondness for lovely women and happy children shows itself also in his delineation of angels. The archangel Michael, the angel visitors of Abraham, and the celestial spirits appearing to Heliodorus all follow closely upon the Madonnas in the purity and serenity of their beauty. In the same fellowship also belongs the beautiful youth in the crowd at Lystra, who is as sharply contrasted with his surroundings as if he were a denizen of another sphere. The ideal is again repeated in the St. John of the Cecilia altar-piece, whose uplifted face has a sweetness which is not so much feminine as celestial. The angel of Peter's deliverance is less successful than the artist's other angel types. The head seems too small for the splendidly vigorous body, and the face lacks somewhat of strength. If Raphael's favorite ideals were drawn from youth and womanhood, it was not because he did not understand the purely masculine. The Æneas of the Borgo fresco, the Paul of the Cecilia altar-piece, and the Sixtus of the Sistine Madonna show, in three ages, what is best and most distinctive in ideal manhood. Raphael's type of beauty is not such as calls forth immediate or extravagant admiration: it is satisfying rather than amazing, and its qualities dawn slowly though steadily upon the imagination. Raphael holds always to the golden mean; no exaggerated note jars upon the perfection of his harmonies. For this reason his pictures never grow tiresome. They stand the test of daily companionship and grow ever lovelier through familiarity. Without forcing the parallel, we may say that something of the same spirit which animated the work of Raphael reappears in the familiar poetry of Longfellow. The one artist had an eye for beautiful line, the other had an ear for melodious verse, and both alike shunned whatever was inharmonious, always seeking grace and symmetry. Their subjects were, indeed, of dissimilar range. Raphael, impressed by the scholarship of his time, chose themes which were larger and more related to the experience of the world, while Longfellow was never very far removed from the golden milestone of domestic life. Yet in diverse subjects both turned instinctively to aspects of womanhood, to what was refined and gently emotional, and turned away from the violent and revolutionary. Hurll, Estelle M. "Raphael: A Collection of Fifteen Pictures and a Portrait of the Painter with Introduction and Interpretation" (BOSTON AND NEW YORK: HOUGHTON MIFFLIN COMPANY, 1899). vii-x. Raffaello Sanzio da Urbino (Italian: [raffaˈɛllo ˈsantsjo da urˈbiːno]; March 28 or April 6, 1483 – April 6, 1520), known as Raphael (/ˈræfeɪəl/, US: /ˈræfiəl, ˌrɑːfaɪˈɛl/), was an Italian painter and architect of the High Renaissance. His work is admired for its clarity of form, ease of composition, and visual achievement of the Neoplatonic ideal of human grandeur. Together with Michelangelo and Leonardo da Vinci, he forms the traditional trinity of great masters of that period. Raphael was enormously productive, running an unusually large workshop and, despite his death at 37, leaving a large body of work. Many of his works are found in the Vatican Palace, where the frescoed Raphael Rooms were the central, and the largest, work of his career. The best known work is The School of Athens in the Vatican Stanza della Segnatura. After his early years in Rome, much of his work was executed by his workshop from his drawings, with considerable loss of quality. He was extremely influential in his lifetime, though outside Rome his work was mostly known from his collaborative printmaking. After his death, the influence of his great rival Michelangelo was more widespread until the 18th and 19th centuries, when Raphael's more serene and harmonious qualities were again regarded as the highest models. His career falls naturally into three phases and three styles, first described by Giorgio Vasari: his early years in Umbria, then a period of about four years (1504–1508) absorbing the artistic traditions of Florence, followed by his last hectic and triumphant twelve years in Rome, working for two Popes and their close associates. Check out the full Wikipedia article about Raphael.